Sydney Shop Girl: Of Cakes and Contouring. You have to find your fun where you can when the weather's going through a hormotional phase. It was cold then it was humid then it rained and then it thundered before it warmed up and cooled down again. It was like living with a teenager minus the acne and floordrobe. Fortunately, I had some crumpet toaster squares in the fridge. Which meant that I was able to endure the weather safely indoors with a thickly buttered and sugared crumpet at my side along with a large mug of tea. I'm one of those people who is much happier watching and listening to bad weather than actually being in it. Following on from yesterday's Priceline baby haul. I just knew I'd forgotten something on my first trip to my local store. Everyone else who had converged on the makeup aisle had at least one of these Australis AC On Tour compacts in their pink baskets and somehow it didn't register that I should have followed their lead. The six colour set has taken the Australian beauty blogger world by storm since its release late last year. Youtube is full of tutorials as well as vlog comparisons of the $16.95 local product (but made in China) against what is apparently the gold standard of modern day facial contouring, the Anastasia Beverly Hills contour kit which can cost around $80 AUD once you factor in shipping and conversion rate costs if you were to order it from the US. Not sure if Sephora Australia has it now though? Probably not... But stop the press, ry hair does sell it for $89 AUD. I'm sharing a YouTube tutorial on the Australis kit by beauty blogger Ruby Golani. She's a genius and very thorough in her guide on how to make the kit work for you and possibly Kim Kardashian Westify your face in the process. This blog post from Painted Lips contains swatche comparisons of both sets that may also be helpful. that Australis' colours look quite different on the skin than what they appear in the pan. On face value, both kits look very similar which can be deceptive. neither comes with an in built mirror. Focusing on the Australis offering, none of the shades have a name so but there is a guide on the base of the palette to help you. The YouTube tutes are also very helpful. I'll be straight with you and say that proper contouring and highlighting of my full face is beyond me at the moment. I'm pushed for time when I get ready in the morning and I don't really have any occasion at the moment to be doing a full face for going out at night. All I really hoped to achieve with a contouring kit was to find something to highlight my brow bones, give my cheek bones a bit of definition and to be able to wave a highlighter powder over the dark under eye circles I'm rocking right now. For reference, I'm olive / medium toned complexion wise. I'll be interested to see if the contour shades work as eye shadows too. If they do, would help cut down stuff to lug around on holiday. the highlighter shades love my pores so much they want to show them to the world in high definition. For me, $10.17 was a bargain price to pay to dip my make up brushes into the highlighting and contouring game. If I can, though, I'd like to try the Anastasia set in store. It's on my list for New York. Have you tried either the Australis or Anastasia kits? Which did you prefer? The other exciting new thing from yesterday was my very own copy of the AWW Children's Birthday Cake Book. I wasn't able to find it at a supermarket or newsagent so had to get mine from Booktopia. The book holds so many wonderful memories for so many children of the eighties. Most of us can remember a favourite cake our parents or grandparents lovingly replicated for us with boxes of cake mix and bags of licorish and mixed soft lollies. Often kept on the cook book shelf in the kitchen, it was the special privilege of the birthday boy or girl to be allowed to browse the book in the weeks leading up to their special day to choose their cake. To me, the book symbolizes childhood friendships, family and love. The cakes all have a homely look to them. They were all slightly imperfect, even in the cook book itself. Which makes them all the more endearing. My mum still has our copy at home in Perth. I was reading that a few of the cakes in the original book have been replaced with new favourites. I'll have to look again closely to see which ones have disappeared. I'm hoping to continue the tradition of an AWW cake for Toddler SSG's next birthday. I wonder which he'll choose? 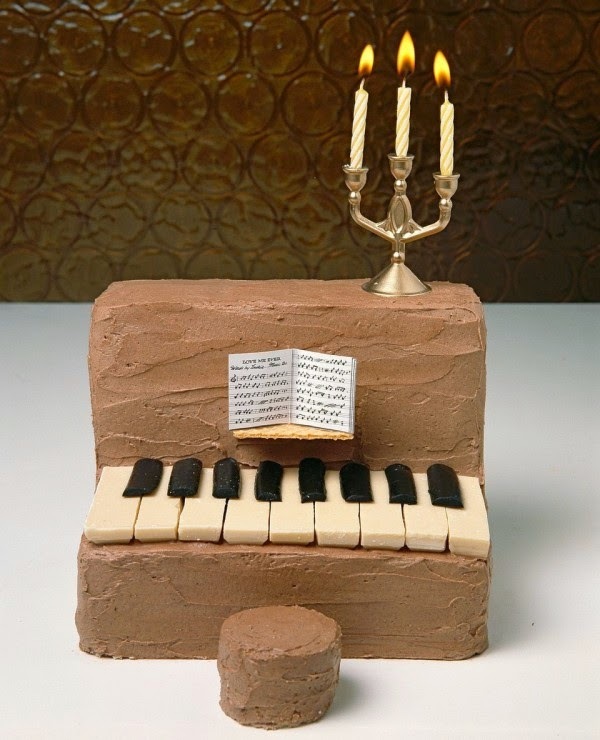 My favourite cake was the piano. It was my seventh birthday cake. It was the white chocolate and licorish keys that did it for me. The cakes of my adulthood may be more beautiful, sophisticated and healthy but none of these little gems hold as many happy memories as those slabs of butter cream frosted, lolly studded butter cake from thirty years ago. I really cannot be bothered with highlighting! Blush is about all I can get excited about.